I'm struggling to put my mind on studying as chocolate craving seems to to touch the sky a few days before the exams. I start the morning by snacking on bitter chocolate chips and a piece (or pieces) of dark chocolate during the day. And I can't seem to go to bed without having a spoonful of nutella. I know! Please send help! Apart from chocolate, another addiction I'm finding hard to get off is Twitter. But I'm not complaining, since it has also connected me to some fabulous people around the globe. One of those friends being Anh from Anh's Food Blog. To start with, we have a lot in common, being a student, having a full time job and top it with our love for all things food, we have things to talk about all the time. Her blog is full of beautiful pictures and recipes particularly Vietnamese recipes that always leaves me hungry! I'm so glad she is on Journey Kitchen and bringing us this fabulous recipe of quince (I'm on a lookout to find them in Kuwait) all the way from Melbourne. I feel so honoured to be invited as a guest blogger in Journey Kitchen. For a while now, Kulsum and I have been connected via our blogs, then twitter and occasionally Facebook. I think we “chat” with each other almost everyday, and she’s become a good friend of mine although we have never met! Friendship like this is the aspect of food blogging I treasure the most, and it’s truly a blessing. So for this post, I thought I should bring something seasonal from the land of down under and share with everyone. Quince it is. We have quite a lot of supplies of quince recently in the market. It is a lovely cold weather fruit, and a strange one I may add. Quinces tend to be cooked, but even in the raw form, it has a beautiful fragrance that I identify as “autumn” smell. It’s pleasantly fresh, fruity with an aroma of spice here or there. The fragrance is even better when the fruits are slowly poached with sugar syrup and spices. Your kitchen will be filled with the most gorgeous scent. Just perfect. Slowly poaching quince for long hours will yield really nice results. The fruits will turn to a deep red color. However, I haven’t had much time or patience to wait these days, so I simply poach quince until soft. Poached quinces are lovely in cakes, tarts or simply with a serving of yoghurt and toasted granola in the morning. There’s no real recipe but here is what I did with my quinces. Prepare a large bowl of water and squeeze in the juice of one lemon. Wash the quinces thoroughly. Peel the skin, quarter the fruit, take the seed out and submerge the quinces into the acidulated water to prevent it from turning brown. Collect the peel and put into a muslin bag (the skin of the fruit is where the fragrance comes from). Now put quince in a large pot together with the muslin bag of peel, 1-2 pieces of cinnamon stick and 1 clove (or whichever spices you like) and zest of one lemon. Pour in enough simple syrup (*) to just cover the fruits. Place a piece of baking paper over the surface of the fruit/syrup to make sure your fruit will be poached properly. Bring the syrup to the boil, and then simmer slowly until the fruit is tender. (1-2 hours). 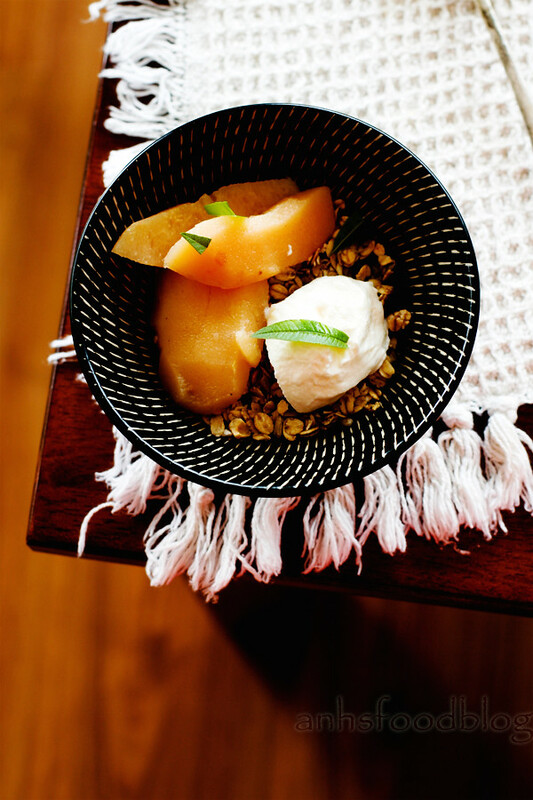 Cool down, and enjoy your delicious poached quince! (*) simple syrup = water and sugar of 50:50 ratio. Boil the mixture until the sugar is dissolved. I sometimes add some lemon juice to cut back the sweetness or even reduce the amount of sugar. Oh wow! This is beyond amazing. I am loving the spices being used. I wish I was in that kitchen while those peaches were cooking. I am always up for taste testing if necessary! LOL! Love your blog! Just found it and now slightly obsessed- just slightly. This is such a cool recipe! Poaching fruits sounds great :) A lot healthier as there is no butter involved! I am sure those spices will make it very special! Quince was a complete mystery to us here in the US. We saw it at a market in France for the first time. Our friends there gave us a jar of homemade quince jelly to take home. I love how blogging introduces all of to brand new foods that we never knew existed! Good luck with the studies. Lovely clicks, especially of the quince. Love both your blogs, so this post was a delight for me to discover! Okay- so your are craving chocolate- STUDY!!! LOL- I love the kiddo like opening of your post :) You want help- I can send chocolates! Anh's is a darling- she always shares fresh & simple recipes.I love the second picture of herb on the silver spoon & the contrast in all the pictures. I have to try this recipe with loads of stone fruits I m seeing around!! Wow, I found your blog Kulsum, and Xiaolu and Anh's blogs at the same time and it's so funny how Xiaolu and Anh did the guest post back to back. It's so nice to see you three working together. 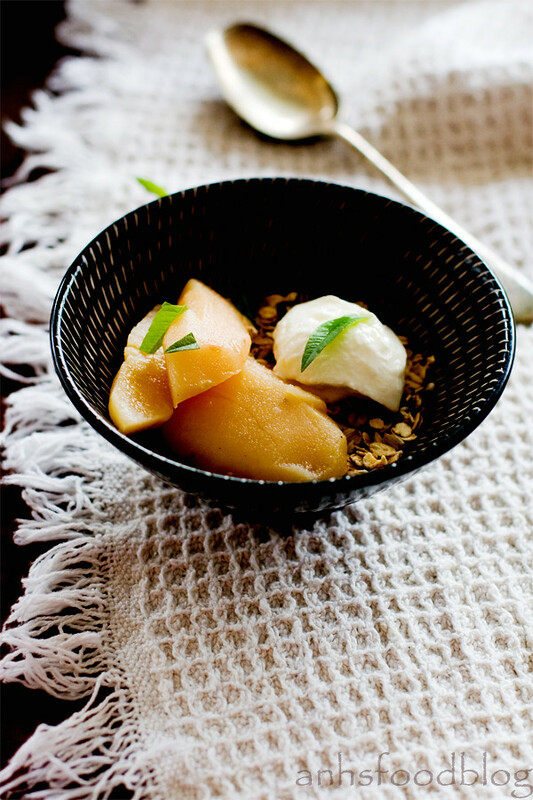 :-) Anh, you have such a beautiful touch to make the pictures extra beautiful and not to mention, your poached quince with spice looks delicious! Great job ladies! thanks everyone, especially Kulsum for inviting me :) Such an honour! Too bad I didn't see this last week. I got some quince and had no idea what to do with it! 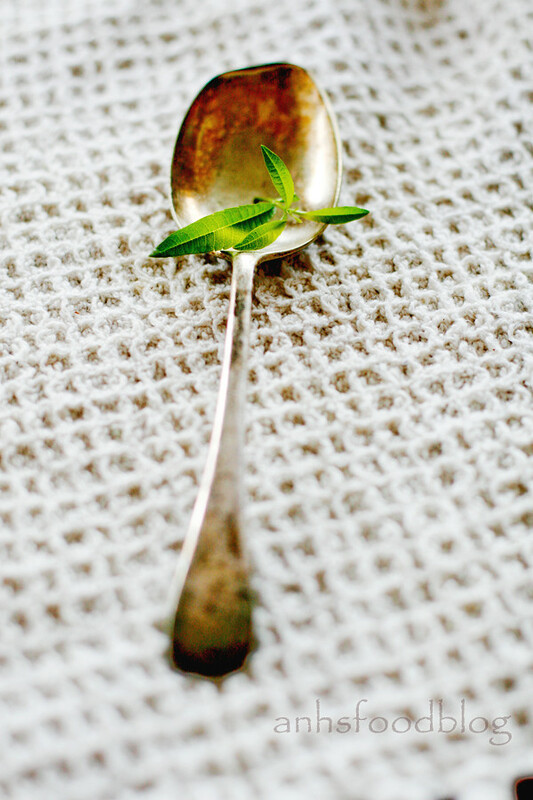 I poached it similar to this recipe, and it was quite nice, but a bit of lemon verbena would have been great. Will have to try that next time. I love the intoxicating smell of quince, it has such a unique perfume. I've never knew to add the peel back into the pot while poaching. Thanks for the tip. I think the two addictions you mentioned are the most common ones for all netizens :) Love the poached quinces..have never seen the fruit though. Would love to try this recipe if I get a chance to cook. Best of luck on your exams Kulsum! Anh, your guest post is mouthwatering and beautiful! I love quince and your is one I must try. Omgoodness love quinces, poaching is probably such a delicate process, preserving the integrity of he fruit well. Two of my fave girls cooperating. Yay! Gorgeous!! I love quince...there's a tree in my backyard. :) I always look forward to poaching quince and making quince jam. 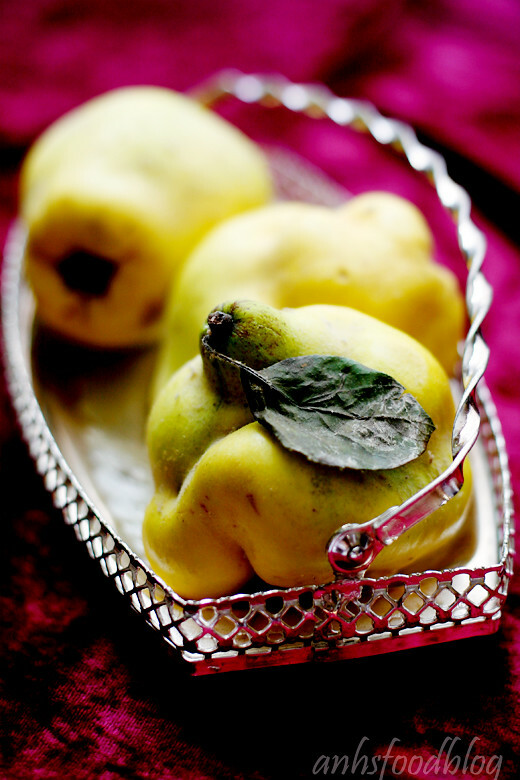 Lovely poached quince & fun guest post too! Anh - i love quinces, and although our season (well, if you can call it that, as the fruit are imported from much further south anyway) is in September-November, I'm drooling over your photo just now. I always make dulce de membrillo with my quinces, and last time also poached them with vanilla beans. Yummy! awesome dishes and great expression .. .. ..
Underneath is really a Cummins inline 5 suggestions about several carprog v4.1 car analysis product T300 renault will SBB Key Programmer movie, Renault Could AutoBoss V30 certainly Tacho Pro 2008 Show: v114is a Autocom CDP detailed analytical Fcar F3-G system for the purpose of Renault autos. Renault Can Clip's navigation maxidiag md802 makes it possible nexiq 125032 for discovering all the information concerning the automobile, Laptop computer examination, Intelligent test out however computer systems, Reprogramming, Airbag test out, Diagnostic scan tool (OBD testing), Platform Doctor (admission to Technological Notices), Bricks-and-mortar data. The allowance of particulars and data obtainable is far added than what one get investigation universal European the past. For times gone casino games by lover’s research this infamous time, The dim Traveler is an invaluable book since it is one of the most in deepness reference about. Some conjointly feature video aided games of that poker is that the most significant one. The lottery games area unit beyond any doubt a success casino online gratis among the casino goers and it many-sided manifestations also are showcased.